The new restaurant at Shangri-La Hotel, Singapore played host to a Tatler Table luncheon filled with delicious nods to more sustainable choices. Dining at Shangri-La Hotel, Singapore’s new Origin Grill is almost always a guilt-free exploit involving some of the most prized produce, as a coterie of Singapore Tatler friends discovered at the recent Tatler Table lunch at the restaurant. Dubbed Embracing Sustainable Dining, the luxury produce featured on the menu upheld the point that dining well can and should instinctively support a more sustainable approach to farming. And even though rare pickings such as the snow-aged full-blood wagyu from Niigata, Japan, or, for that matter, the wild-caught Fremantle octopus, epitomise a more lavish choice, they represent indulgences that figuratively and literally won't cost the Earth. “Happy cows make better beef,” bubbly chef de cuisine Heidi Flanagan declared, as she shared some of the unique qualities of the Williams River cross-bred wagyu tenderloin the guests enjoyed. 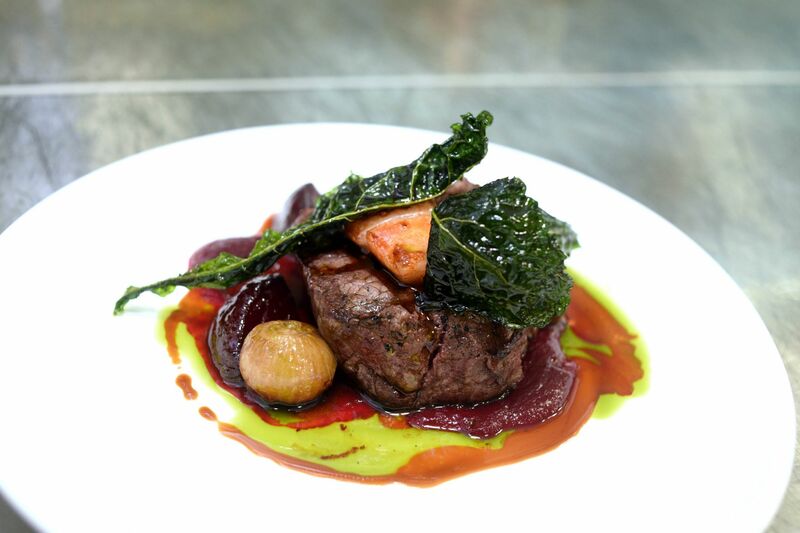 The specially bred, 400-days grain-fed beef (with a marbling score of 5/6) from Australia was served topped with luscious bone marrow over beetroot confit with kale crisps and shallot jus. “It’s important, especially in this day and age, to be mindful of the carbon footprint we leave on the planet,” Flanagan adds, explaining how the choices we make not only affect our well-being but also the health of the planet and the communities that supply the restaurant industry. That choice, T.Dining’s Content Director Don Mendoza affirmed, is also in the hands of the consumer, adding that the joys of dining well is only multiplied when we dine with a conscience—when our appetites are not bigger than our ego—to which everyone raised their glass of small-batch biodynamic Slovenian sauvignon blanc by Domaine Ciringa Fosilni Breg (winemaker Armin Tement is committed to biodynamic farming practices) in agreement. Eating well should always feel this good. Watch chef de cuisine Heidi Flanagan expound on the beauty of dining with a conscience. Cooking with "happy cows" has benefits, says Chef Heidi Flanagan of Origin Grill & Bar.